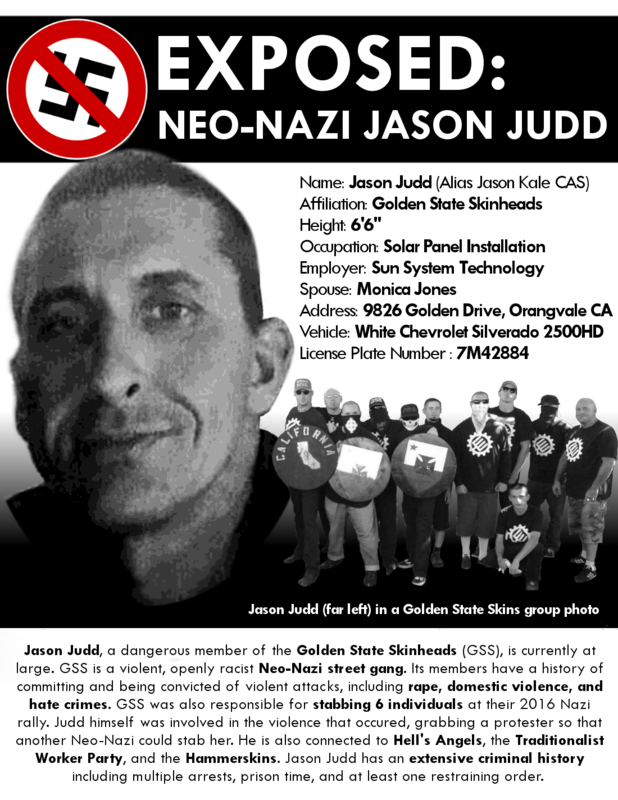 Jason Judd (alias Jason Kale) is a longtime Neo-Nazi and a member of the Golden State Skinheads (GSS). He is also associated with Hell’s Angels, the Traditionalist Worker Party(TWP), and the Hammerskins Nation. He was one of 20 GSS and TWP members who appeared at the 2016 neo-Nazi rally at the State Capitol in Sacramento, a demonstration that was ultimately shut down by a mobilization of 400+ anti-fascist counter-protesters. In the violent brawl that ensued, GSS members attacked counter-protesters with knives and sticks, specifically targeting visibly queer and non-white demonstrators. Judd himself was directly involved in the stabbings that occurred, grabbing a POC protester so that another Neo-Nazi could stab her. That particular antifascist sustained serious injuries and was hospitalized for 4 days. Jason Judd (back center) wearing a TWP shirt and border patrol hat while holding an anti-fascist counter demonstrator from behind as another GSS member stabs her with a knife. 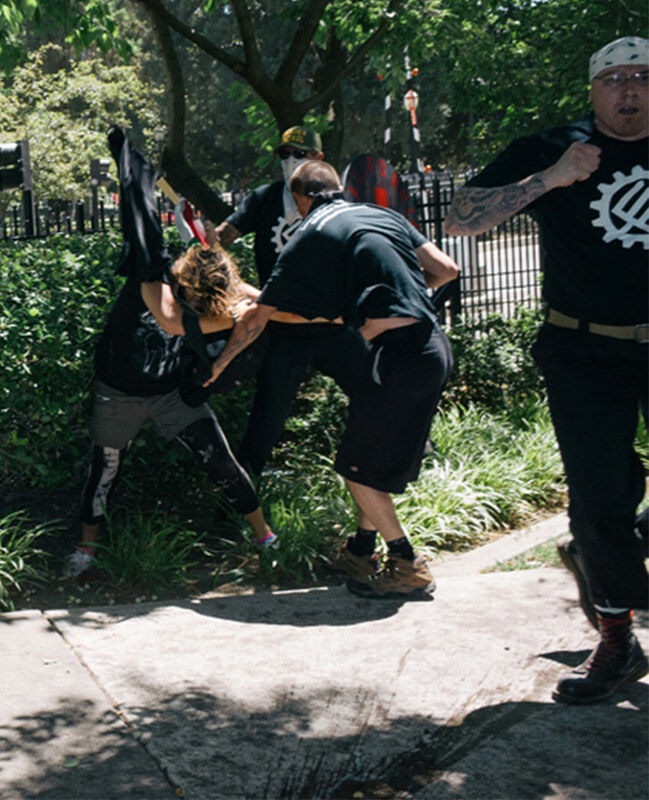 GSS and TWP members who attended the 2016 Nazi rally refer to themselves as “Sacramento Spartans”, and commonly wear a commemorative patch that depicts TWP( now a defunct group) member William Scott Planer striking an antifascist protester with a pole. Judd has posted pictures of himself online wearing said patch, and the same imagery appears on a large “Sacramento Spartans” banner in his garage. Judd is clearly proud of his part in the racist attacks that took place that day. 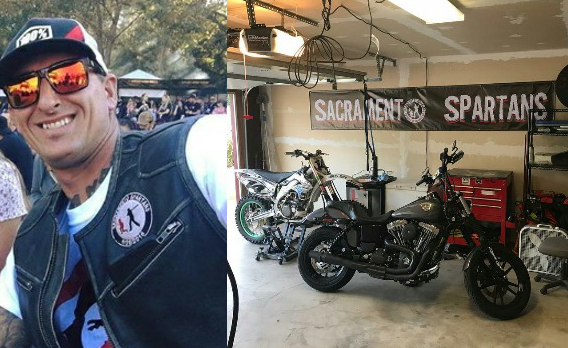 Left: Jason Judd displaying the “Sacramento Spartans” patch on his motorcycle vest. Right: A “Sacramento Spartans” banner in Judd’s garage. Jason Judd has an extensive criminal history that includes multiple arrests, prison time, and at least one restraining order. 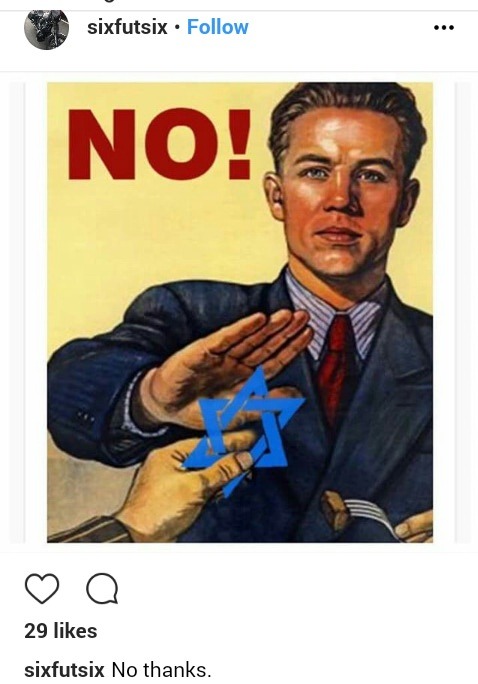 He is loud and proud about his Nazi affiliations, and his online posts exemplify his racist, anti-Semitic beliefs. Until recently, Jason resided in North Highlands, CA, across the street from the American River College campus. He now lives with his partner and their two young children in Orangevale, a suburb of Sacramento. 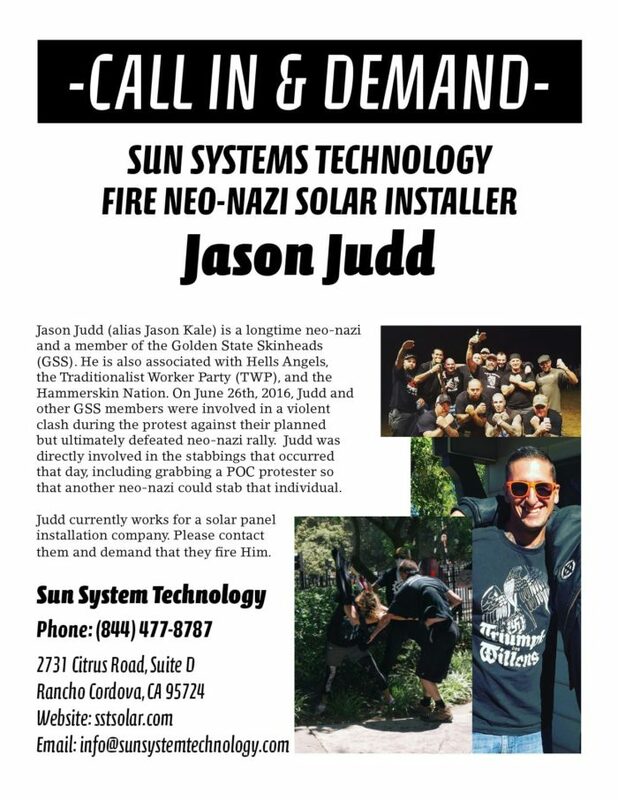 He works for a solar panel installation company based out of Rancho Cordova, and isn’t shy about being a Neo-Nazi even while on the job. Left: Judd posing in front of a company vehicle. 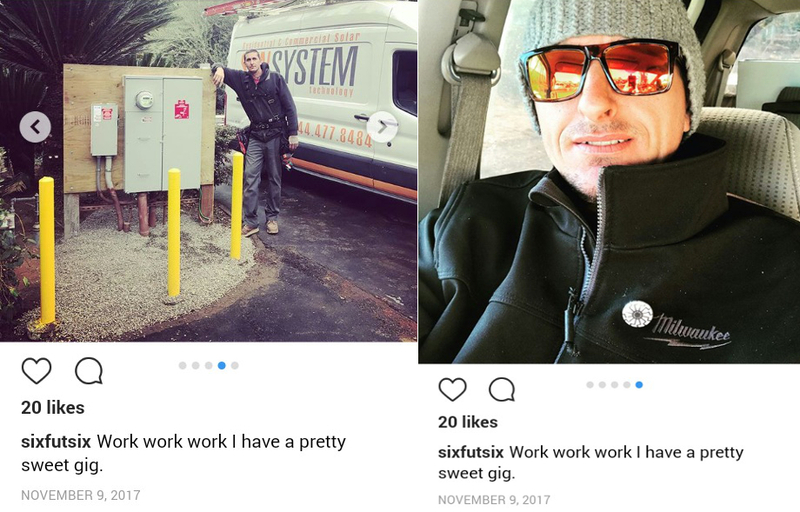 Right: Judd sporting a black sun symbol pin while at work. The black sun symbol is commonly used by American neo-Nazis and white supremacists, and has been associated with Nazism since the 1950’s. TIPS: block your number (#67, before phone number), keep it short, just hang up! REMEMBER: This is a one way exchange of information. You do not have to answer any of their questions or provide them with any information outside of the script above. Join us in making them aware that they are currently employing a dangerous Neo-Nazi who has participated in violent and racist attacks against oppressed groups. You can also leave them reviews on Yelp, Google, and Glassdoor. Jason Judd’s current address is 9826 Golden Drive, Orangevale, CA. 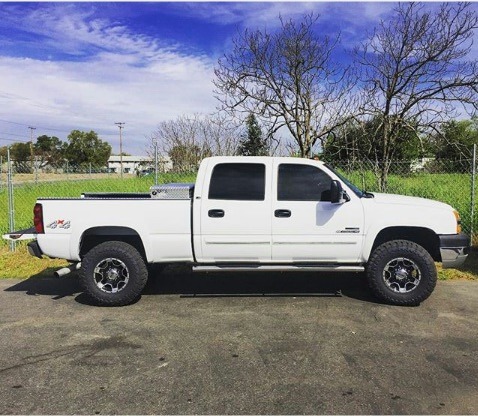 Jason Judd’s truck, a white Chevrolet Silverado 2500HD , license plate number 7M42884.